One of the UK’s best known ‘upcyclers’ is adding his support to a new community wood recycling business in Wolverhampton. 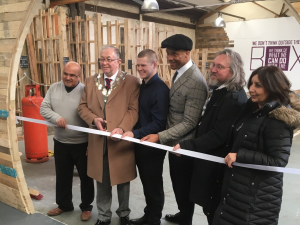 Local entrepreneur and TV star Jay Blades joined the Deputy Mayor of Wolverhampton Phil Page to officially open Wood Saints yesterday and immediately praised the social enterprise’s commitment to providing training, volunteering and employment opportunities for up to 30 people every year. More than 40 delegates were treated to a guided tour of the company’s Wood Depot in Dixon Street and heard how it plans to give unwanted wood heading for landfill a new lease of life by creating new products or recycling it into useable material. Backed by a £220,000 grant from the Big Lottery’s Power to Change Initiative, the firm has already signed up a number of businesses as its first customers and is now urging construction companies, distribution specialists and manufacturers in the Black Country and Shropshire to save money and boost their social responsibility by signing up to its collection service. Useable wood that could end up in a skip, from pallets and scaffolding boards to off cuts and floorboards, is wanted and, for a minimum fee, will be brought back to the organisation’s site. “I’ve been following the progress of Wood Saints for some time and am genuinely delighted to officially open it today…it’s a fantastic enterprise and one that resonates with me, as it’s helping disadvantaged people by giving them new skills,” explained Jay Blades, who has appeared on ‘This Morning’ and now presents ‘Money for Nothing’ and ‘The Repair Shop’. “They’ve taken a derelict facility and turned into a hub of creativity that will be used to repurpose wood, create exciting new products and, in the long term, offer incubation space for local crafts businesses. I can’t wait to see it take off. Wood Saints, which is the latest venture from All Saints Action Network (ASAN), has taken a 10,000 sq ft empty industrial unit and spent six months transforming it into a dedicated wood depot that features a wood storage area, workshop and a retail outlet that will stock ironmongery and products made out of the re-used material. “This is an innovative way of saving valuable resources whilst creating employment and training opportunities for local people in the All Saints community,” explained Iftikar Karim, Wood Saints Recycling Manager. He continued: “People of all ages and backgrounds can volunteer. We will give them training and also pay for them to take their CSCS (Construction Skills Certification Scheme) card if necessary. It could potentially be the first step on the ladder back into employment. Pat McFadden, MP for Wolverhampton South East and Councillors Sandra Samuels and Zee Russell have also visited and pledged their support to Wood Saints, with Wolverhampton City Council exploring ways where it can engage with the social enterprise by making introductions to the construction companies in its supply chain. “I was thrilled to visit the site on Friday and welcome this fantastic new enterprise in to my constituency. I wish ASAN every success with this new venture and I look forward to seeing how the project develops over the coming months,” added Pat McFadden. Mick Moreton, Recycling Supervisor at Wood Saints, concluded: “We work on so many fronts…we are making an environmental difference, we are making a social difference and we will hopefully be making a financial difference to all the firms that plan to use us. ASAN Wood Saints is a member of the National Community Wood Recycling Network and is a licenced waste carrier operating across the Black Country, South Staffordshire, Telford and Shrewsbury. All Saints Action Network (ASAN) is a registered charity and company limited by guarantee established in 1995 to improve the quality of life for people living and working in the All Saints area of Wolverhampton.